Tile coasters were one of my first DIY projects I posted on this blog and one of the things that I still use in my house everyday. BUT I'm really tired of looking at these, so I made some really simple new tile coasters using a bunch of stuff I had floating around my craft cabinet. You'll need: Ceramic Tiles, Mod Podge, Acrylic Sealer, a Sheet of Self-sticking Felt, Scissors, Foam Paint Brush, and different colored tissue papers. I also used a patterned tissue paper with a white background so the pattern would show through. Starting with the patterned tissue paper, rip pieces of tissue paper and glue to the tile using Mod Podge. You'll want to paint a layer of glue on the tile, press the piece of tissue paper down and then paint a layer of glue over the tissue paper. Try and keep the paper from becoming too wrinkled, but some wrinkles are okay. 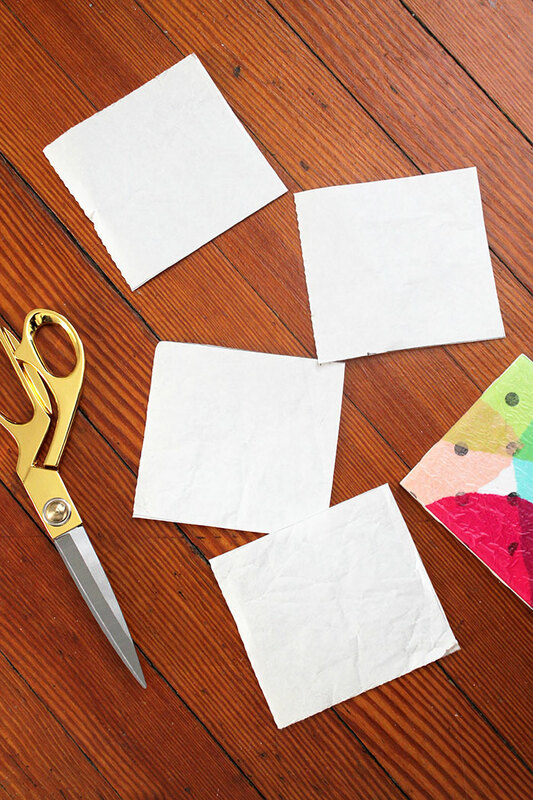 Layer the pieces of paper to create a random pattern that is slightly different per tile. Use the corners of the paper at the corner of the tile. Each time you add a piece of tissue paper, include a layer of glue. Once you've placed the tissue paper pieces where you want them, apply a final coat of glue over the entire tile and sides, and let it dry completely. Once the glue has dried, apply 2-3 coats of sealer over the top and sides of the tiles to seal everything. Let dry completely. Cut your self-sticking felt sheet into 4 even sides pieces and attach to the bottom of each tile. Done. I don't have any Thanksgiving decorations. Mostly because Tim and I travel for the holiday and we don't have a dining room, but I also because I find it hard to create decorations for. It's a lot of browns and oranges, and turkeys. I knew that I wouldn't be hosting Thanksgiving, but I do spend time making pies for our family dinner so I decided some kitchen decorations were in order. I've been wanting to make a sort-of appliqué tea towel and thought this would be a great way to display some Thanksgiving language in our home. Here how I put it together. 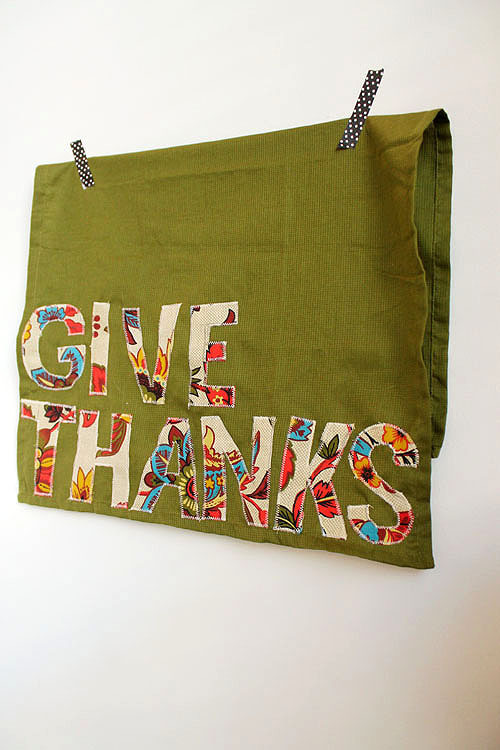 You'll need a dish or tea towel, fabric, scissors, straight pins, and a sewing machine. 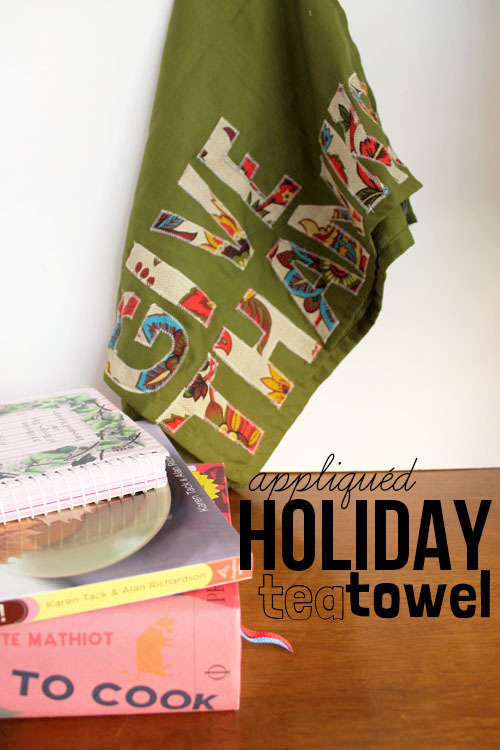 I didn't end up using that dish towel in this picture and swapped it out for a green one. Depending on how many letters your wording has, cut enough same sized squares out of the fabric. My squares were about 3in x 3in. Using a pencil, draw one letter per square, making sure to keep them relatively the same size. I chose Give Thanks. You'll want to lay the letters out on your towel to get a sense of the spacing you'll need, but I chose to pin only the one I was sewing. 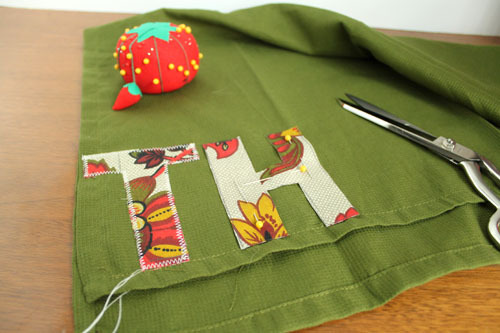 Begin the sewing process by pinning that first letter down with 1 or 2 pins. Using a zig zag stitch, sew around the outside each letter. You'll want to stay right along the edge and when you get to a corner, simply put the needle in, lift your presser foot, and rotate the fabric. Once you get all the way around, tie the extra threads together on each side before moving on to the next letter. The hardest part is doing circular letters. That "S" was very difficult and frustrating, but just take your time and go slow. You'll do it. And it doesn't have to be perfect, it's handmade! I love it! It adds such a perfect touch of holiday spirit to our little apartment. And these would make great hostess gifts to whoever you celebrate your Thanksgiving with. The color combinations and fabric can be switched out for any decor, holiday, or personal preference. You can even personalize it for a housewarming party or a favorite saying. Possibilities are endless! If you've ever seen my thrift/flea market find posts, you know that Tim is an avid record collector. Our collection started out pretty small, but in the past year or two has really grown into something we're both very thrilled about. We like to have a combination of artists we love, and great party music. I've been staring at this blank wall since we moved into this apartment but didn't want to spend a ton on art work for the space. Then I decided on this idea! 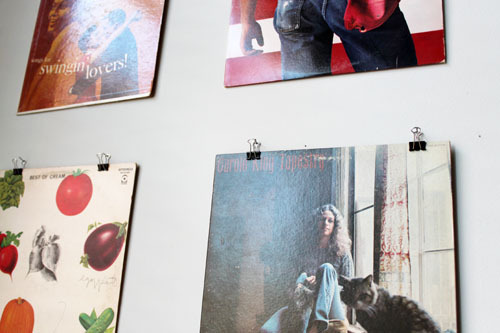 Free, easy wall art that also displays some of our favorite records! This little project is so easy. Actually, figuring out the placement and which records to display is the hardest part! 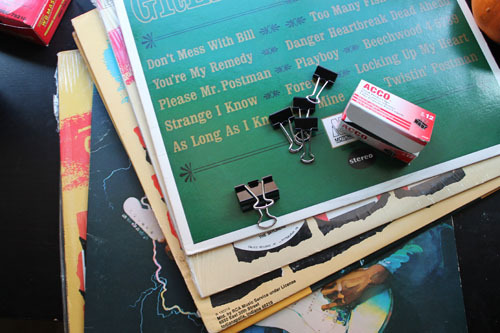 Attach binder clips to the records you want to hang and use a nail to hang them on the wall. I wanted to choose covers that I loved, and different genres of music. I'm pretty in love with the result. And I didn't have to spend a ton on artwork for the space. Win win. 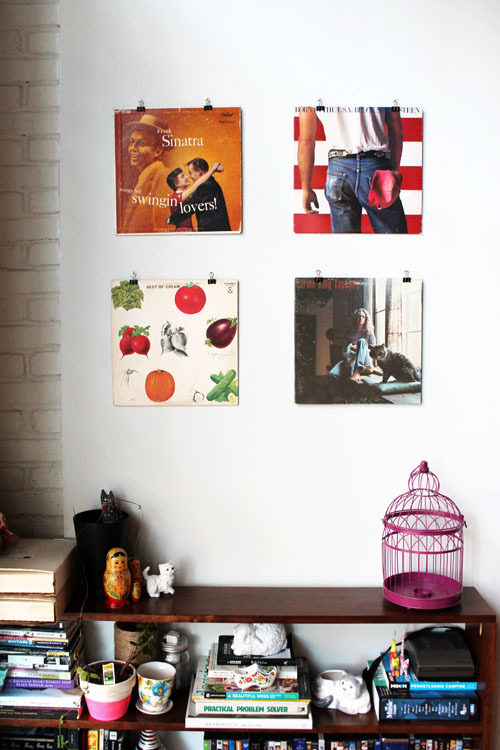 Do you display any nontraditional collections in your home? A few years ago, I found these beautiful glasses on Anthropologie.com (which are sadly no longer available) and I loved the idea of hand-painting glasses. 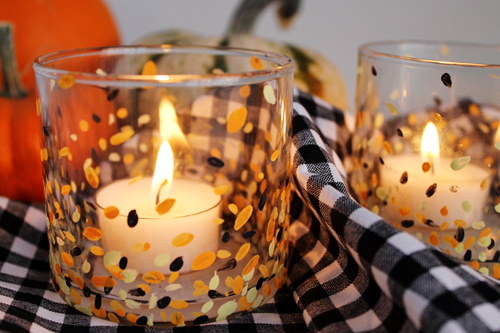 When I found these 69cent glass candle holders at the thrift store, I knew I could turn them into a perfect additions to my tiny fall decorations. 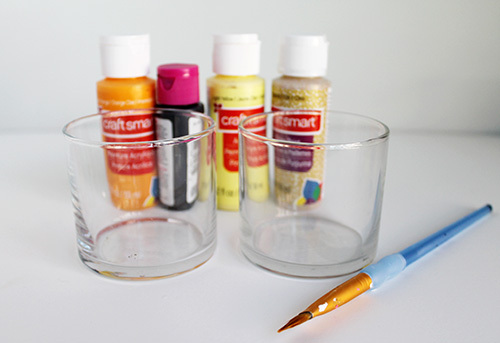 For this little project, you'll need different colors of craft paint (I used orange, light yellow, and black), your glass candle holders, and a paint brush. 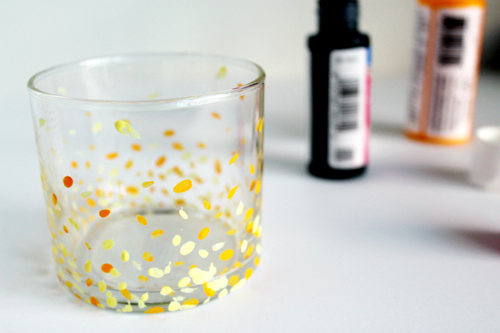 Start by applying the one color of paint in different-sized small dots around the glass candle holders. 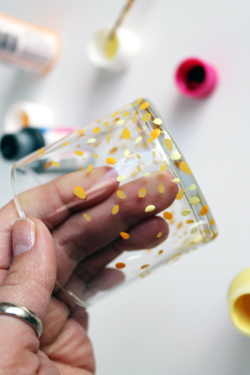 You'll want to apply them closer together around the bottom of the glass, and more scattered around the top. The overall goal is an ombre effect, but it takes a little bit to really start to see what the end result will look like. Don't give up! Begin applying the other colors, following the same strategy as before. You want to focus on filling in the open spaces along the bottom of the glass, and be sporatic about it. It doesn't matter if some of them overlap and try to get different sizes, and going different directions. If you notice the colors blending too much, let dry for a few minutes between colors. I went around the glass twice with each color, alternating between paint colors. And that's it! Insert a votive or tealight candle and light. In love. Perfect easy fall decorations are my favorite. 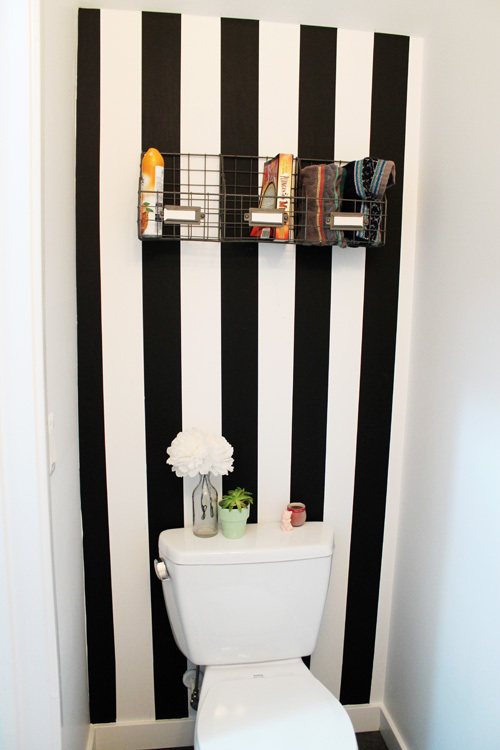 I knew that I wanted to do something powerful in our tiny downstairs bathroom. It's so tiny and so, so boring. I thought about painting it, maybe chalkboard paint or polka dots, but having to repaint that cramped little space seemed like a hassle in 10 months when we might move again. And then I saw this post by A Beautiful Mess and a lightswitch clicked on. Washi tape stripes! Yes! Cue the epic music! 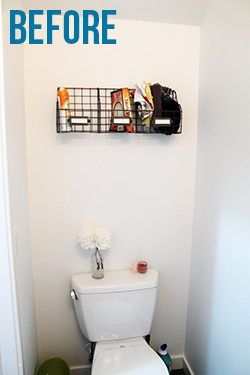 I'm telling you our powder room is tiny (so I apoligize for the one-angled photos, that's the only angle there is.) and now it just feels special. The tape lays very flush with the wall and looks pretty much just like paint, but when we move we can easily just peel that off and move on with our lifes. And it was much cheaper than renter's wallpaper. The hardest part was just starting. I ordered mt x CASA Interior Washi Tape in black over a month ago, but the project felt very overwhelming and math-focused. I would get all excited at work thinking about taking it on when I got home, then would get home and think about all that measuring and my brain would start to hurt. So one day when I had off from work, I decided to just do it. 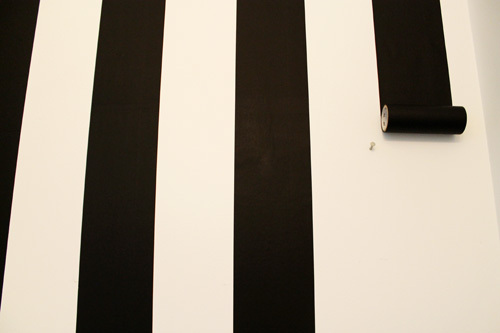 I started trying to line the tape up with the side of the wall and quickly realized the walls were not straight. To make that less evident, I put my first piece in the corner with half on the side wall and half on the actual wall I was doing. That hid that it wasn't perfectly straight. Getting the tape to lay flat is tricky and take a few mess-ups to get right. You have to move slowly and start at the top and work your way down. I found it helped to keep the roll in my hands parallel to the ground and not pull one side further than the other. Smooth out any air bubbles as you go, pushing them down or to either side. A few times I ended up with small creases, but just rub them until they are flat enough to be unnoticeable. 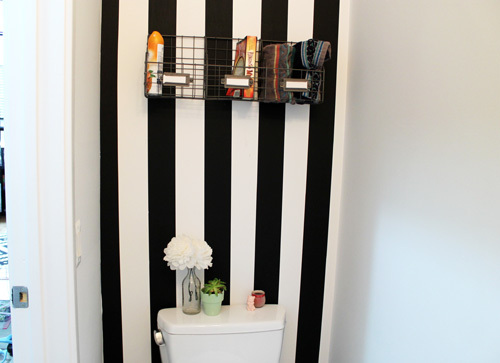 After all the stripes are up, use an Exacto knife to make a clean cut at the ceiling, side, and bottom. And that's it! I'm very much loving it and for how long I put this project off, it was fairly easy!